My yesterday evening trash run was a good one. I first came across this bunch of trash in front of a house with a “for rent” sign in the window. From it I saved a few random knick-knacks, a frisbee, and a couple of X-BOX 360 games. I also found these necklaces hanging from a clothes hanger. I was a bit excited to see the second from the left as the clasp had a silver mark on it, however when I got home I realized that someone had just soldered parts of a silver chain to the base. 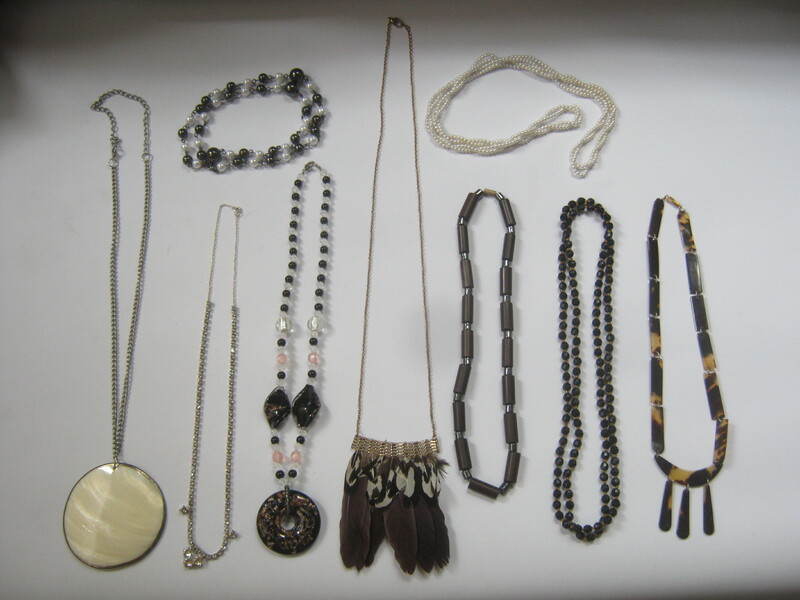 Still, these are all nice pieces which should sell at my yard sale. I should mention that the (much discussed) yard sale is currently scheduled for this Saturday. It’ll feature “garbage finds” but my room-mates will also have some things for sale. The weather is supposed to be nice so I don’t anticipate having to cancel due to that. I’ll let you know for sure before the end of the week! My best finds though came from this place. When I got there the bags were already ripped apart, revealing a treasure trove of ephemera, random tools, bric-a-brac and collectibles. I spent the hour or so before the truck came almost frantically looking through as much as possible, knowing that my time to explore this stuff was quite limited. I could definitely have spent a lot longer picking through this stuff and I’m sure many valuables ended up being trashed. 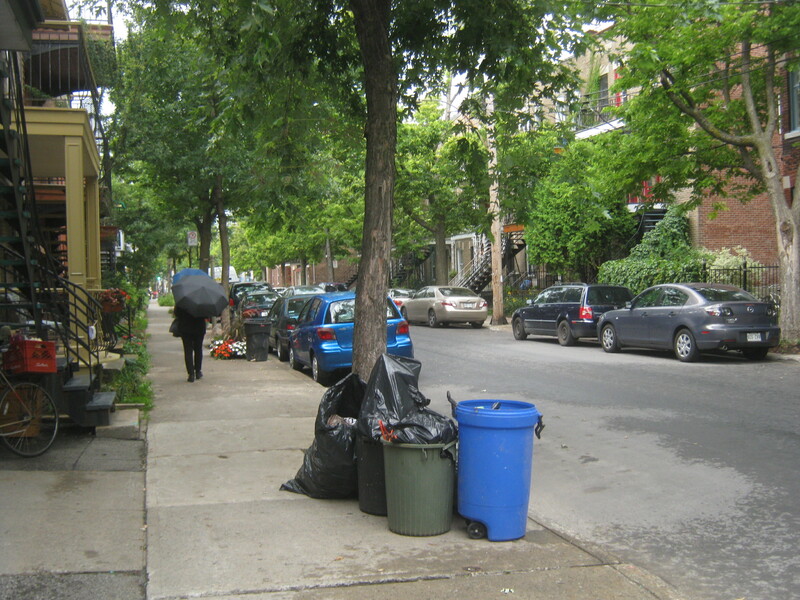 Inevitably, the garbage truck came by (much like death and taxes) and took all the “garbage” away. I felt bad about the mess created by whoever was there earlier and I helped the worker load up the truck. Quite the role change! Most of the items came from the late 60s to early 90s. Word on the street is that the person who once owned this stuff disappeared around twenty years ago. I met a couple of pickers here, one guy found an old voltmeter and another found a few vintage straight razors. I must say I was jealous of the razors, I’ve been hoping to find one for a while now! One of the guys commented that he thought whoever owned trash was a bit like him in that he knew how to fix anything. Indeed, the diverse range of things I saw would indicate some sort of jack of all trades. I think he may have been a professional photographer at some point as I recovered some very repetitious photos and slides. Finding a big pile like this and knowing you don’t have the time to see it all before the truck comes is actually more stressful than fun. If I had gotten there a bit earlier I would have been able to enjoy the process a bit more (and maybe find those straight razors!). Still, I did manage to save a fair bit. It would have been nice to have the bike trailer, though on the other hand it would have slowed me down a bit and I would have gotten there even later. Most of what I saved was ephemera. I’ll do another post featuring that kind of stuff. For now I’ll show you the curiosities and collectibles. 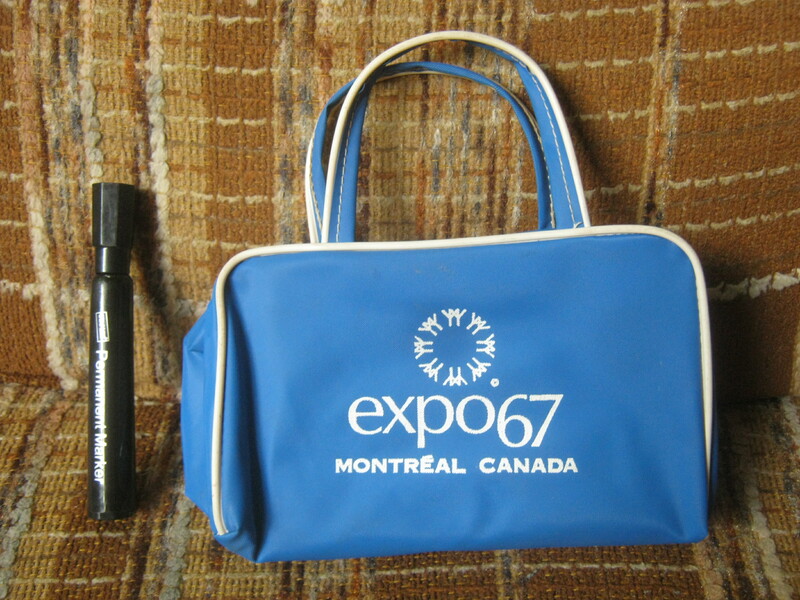 This little Expo 67 handbag might have been my favourite find. It was a bit dirty when I found it but it cleaned up pretty nice. It’s copyrighted 1963 so I’m thinking this was made before the actual fair. This kind of thing is fairly collectible. However, I’m not in a rush to sell, it might be useful for me to store stuff in. 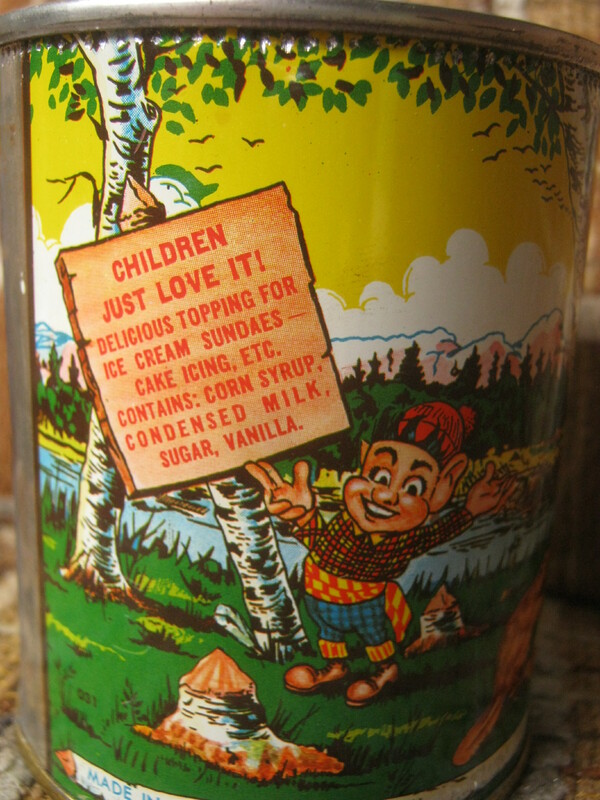 I like this old tin as well. 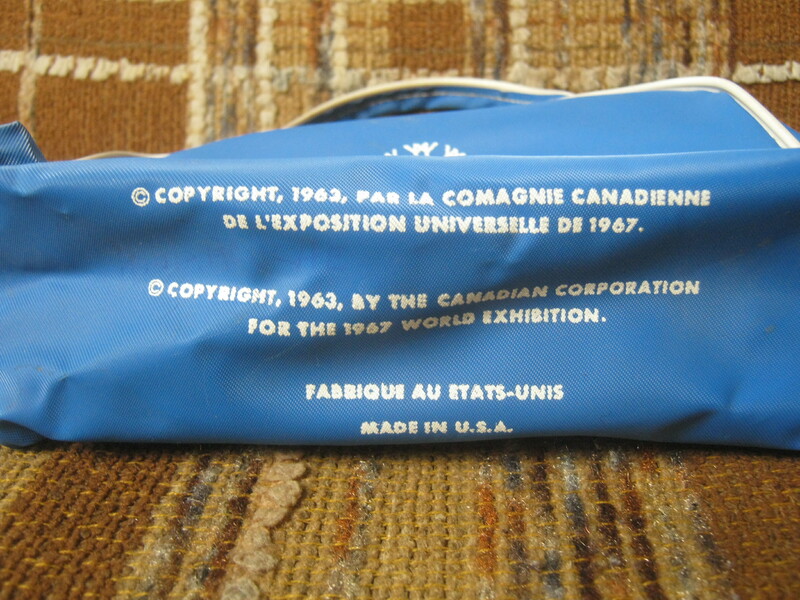 It was made to hold caramel butter made by the Montreal-based (and now defunct) Ernest Carriere Inc. How old do you think it is? I would guess that it’s from the late 1950s. 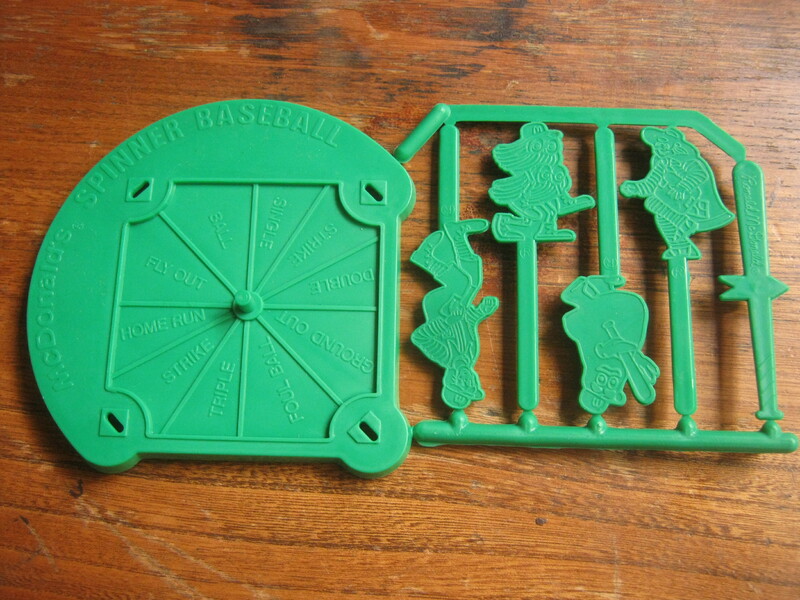 I found three of these McDonald’s “spinner baseball” toys from 1983, back when plastic stuff was still made in the US. One of these sold on Ebay for 8$, believe it or not. 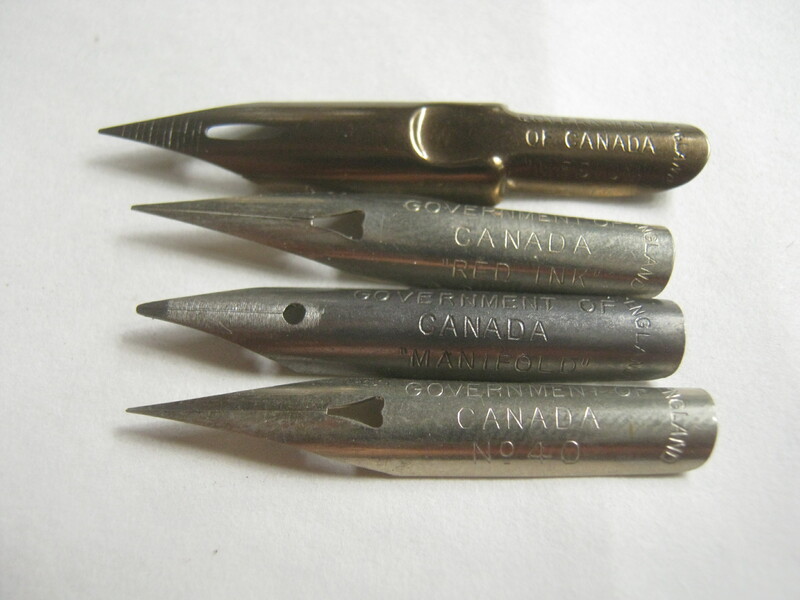 These fountain pen tips are kind of cool because they’re all marked “Government of Canada.” There’s four different types: most are “medium” but there are one each of “red ink” “manifold” and “no. 40.” The “Government of Canada” stamp makes me think that these could have some value. 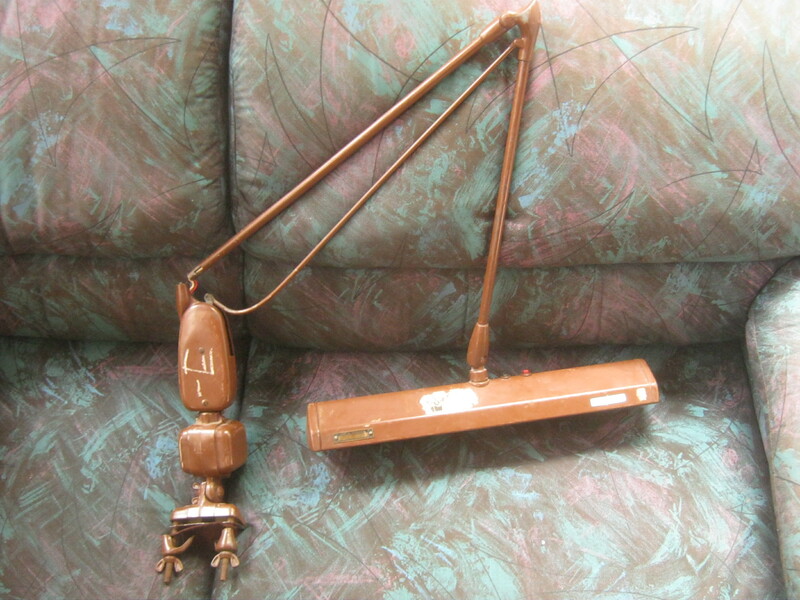 Last but not least is this sturdy old lamp which was designed to clamp to a desk. It needs a bit of work but I don’t think it’s anything that can’t be fixed. 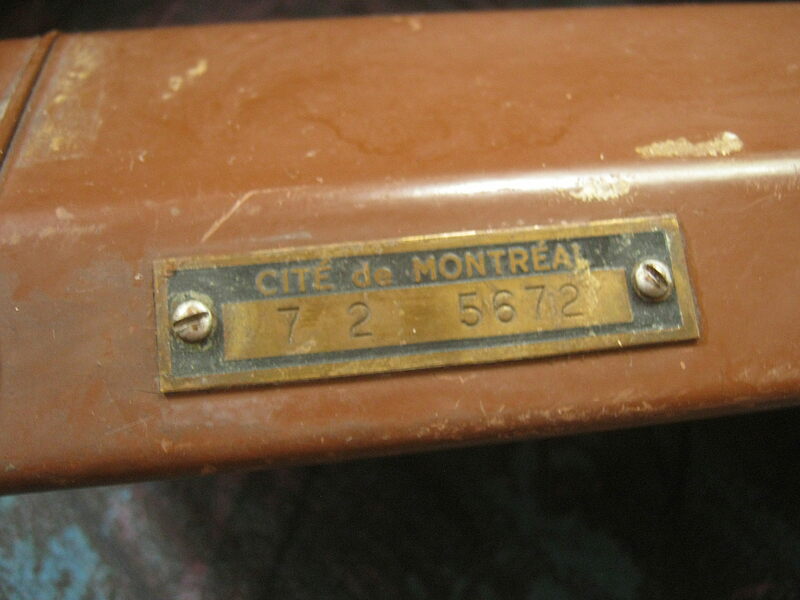 It features a tag marked “Cité de Montréal” which gives you a hint of its age – la Cité became la Ville after 1964. I think the name changed because the word “cité” was more appropriate for the historical city-state than it was for the modern city. I’m not sure though, so let me know if I’m wrong! One of my fellow pickers told me to bring this lamp to the Gay Village, apparently there are a lot of shops around there that buy this kind of thing. I may just cut out the middle-man and try to sell it myself, though. I’ll show you some more of what I found in the coming days. In the meantime, I’ve got to do some cooking and cleaning to do! That expo bag looks like cheap vinyl, and if so may not hold up so much. We may have had one, or definitely had something made of that sort of material, and once it ear or is cut, it is garbage. It probably is valuable as a souvenir. It’s safe to carry light thing, so you can show it off, but likely not a good thing to jam lots into. I think that sort of bag was sold as souvenirs, but it might also have been issued to staff. The hostesses in their “futuristic” uniforms might have carried them as handbags. Your description of the owner sounds like some people I’ve met, and garage sales I’ve gone to. They live in a oft, they collect things (actual collecting, not just amassing things) and then they have to move, and so it’s open house. They may expect too much on the items, but the collection of things is comprehensive. And generally, those are “inside” sales, they can’t be bothered bringing it all outside. Best vintage lighting shop in Mtl is Lambert & fils https://www.facebook.com/pages/Lambert-et-Fils-%C3%A9clairage-mobilier/166395876740874?filter=1 – maybe see if they’d be interested in the lamp, Martin? I could see it upgrading it’s “cool” quotient if it was sprayed a better colour, like matte black or crazy bright! 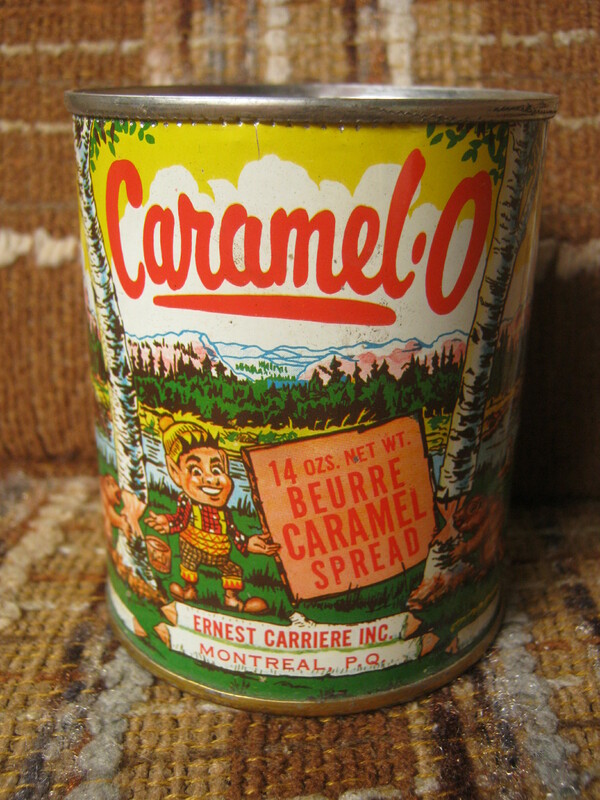 I remember that caramel spread can, so I’m guessing late 50s through early 60s. Just curious … what kind of light bulbs does that lamp take? That’s a very intriguing post.I want to read more about the ephemera that you rescued.Please tell us:How many of trash bags had you gone through by the time the truck came?You should have pushed the unchecked bags to the side and saved them in another alley so that you could have foraged through them after the truck passed.I want to know how many bags went unchecked. I’d say I looked in all the bags, just not as thoroughly as I usually like. 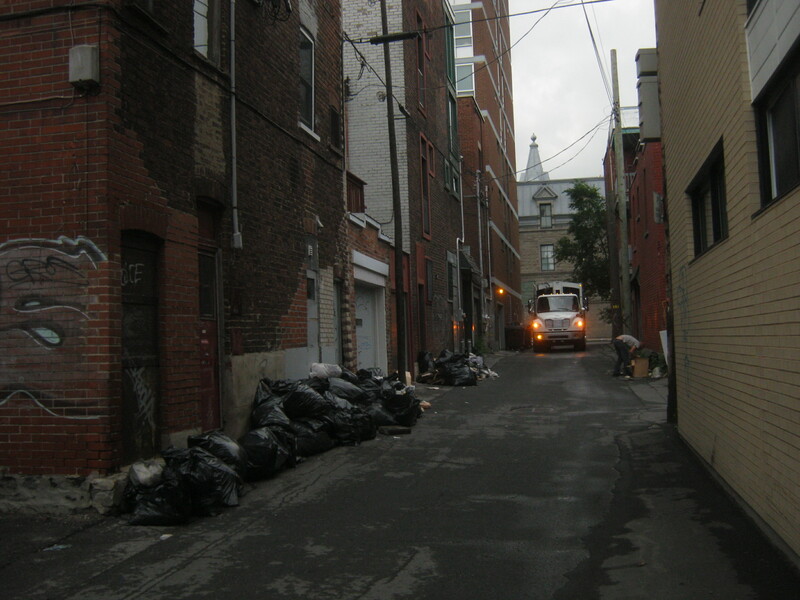 In this situation (especially with competition) moving the trash elsewhere wasn’t really any option. Huh! 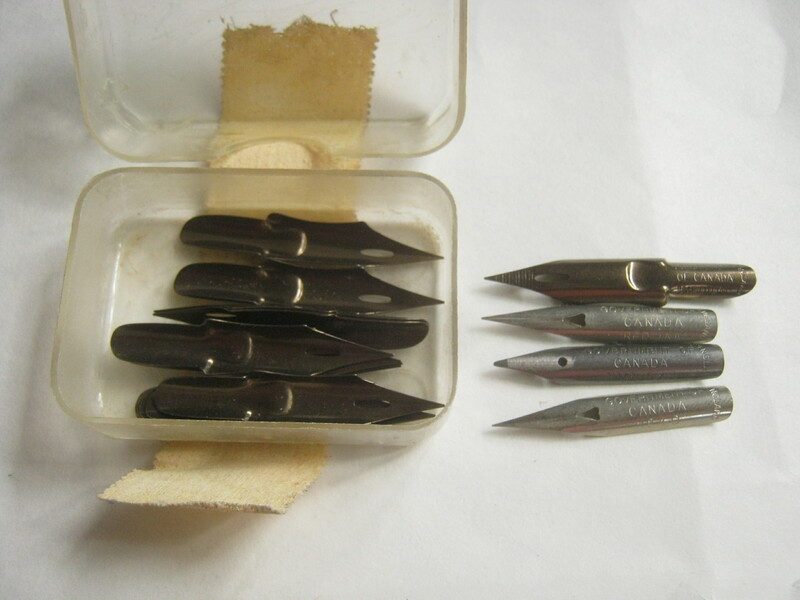 I’ve been looking for pen nibs for a while now (for an art project). You wouldn’t happen to be willing to part w/ one or two of them, would you?